I turn 29 soon and just last night had a look at my "30 by 30" list which I wrote in April 2012. My life has changed drastically since then. I am now divorced and moved interstate. I have done 15 things on the list though which isn't too bad. I have just over 1 year to do the other 15! I am now a full time single mother, so the travel ones will be harder. My kids are only 5 and 6. 1.) Snorkel the Great Barrier Reef I really don't know if I will get this in the next 12 months. 2.) See Uluru another one I am not sure I will be able to do this year. 5.) Climb Mt Kosiusko - this was booked in a couple of times, but Australia gets hazardous and I have had to cancel due to bushfire risk. 6.) Raise $10,000 for a charity - I am doing the CEO sleepout in June and the Community Sleepout in November. The money goes to help the homeless, something I am passionate about. I'd love to raise $10,000! My more realistic goals are $2,000 each. 7.) Shoot a gun - Did this in San Francisco in 2013. I am apparently a natural too, with good grouping and when we shot in the traps on my 4th shot I hit it. I now want to own my own gun and shoot more. 16.) Finish my dream bedspread set. Done, then I got rid of it because my taste changed. 21.) Do 101 random acts of kindness - I started this a little on my 101 things, but it sort of fell by the wayside. I am picking it up again. Too easy. I do acts all the time. 26.) Have a white Christmas - Christmas in Australia is in the middle of summer and I long for a white Christmas. Thanks to issues with the ex, I am not sure I will be able to take my daughters out of the country. 27.) See whales in the wild - This is doable twice a year where I live apparently. Ok, about 1 hour from where I live but I am determined to do it. I am now 3hours from it, and don't really care if I see them or not. 28.) Read The Bible - I have been 'trying' to do this for way to long. I need to complete it already! I no longer care. I am not Mormon anymore, I still believe in God, but don't feel the desire to read The Bible. 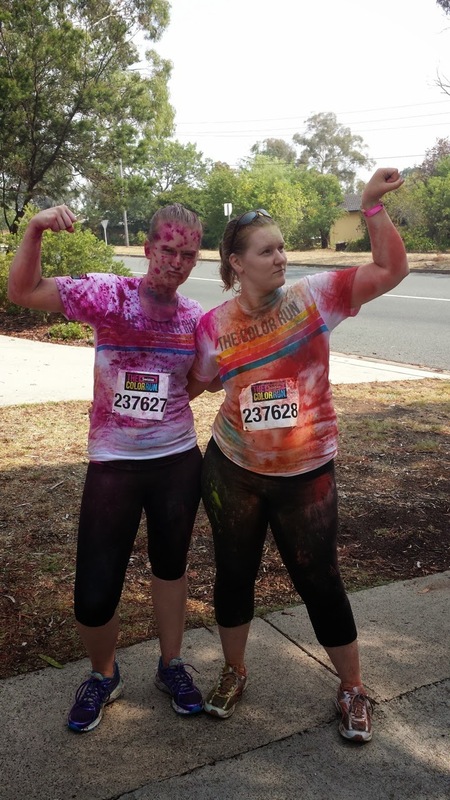 Today I did the Color Run with my big sister. She was in a team with people from work who were walking it and I was running it on my own. It was cool, but I don't plan on doing it again. One of my goals is to run a marathon. I love running, but I am not such a fan of crowds. 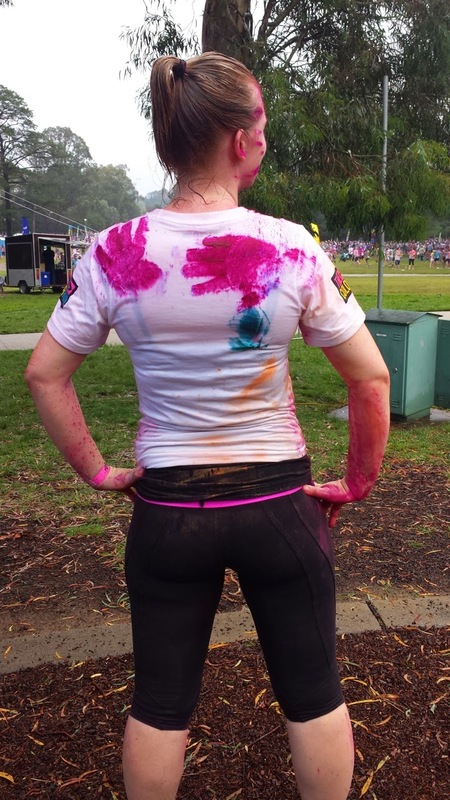 There were 12,000 people at the Canberra Color Run. It was meant to be runners to the right, walkers to the left, but it really wasn't like that. There was congestion and bottlenecking on the course which frustrated me a little. I'm glad I wasn't trying to do a personal best, but just there to have fun. My favourite colour section was blue. I got an awesome guy who squirted heaps and it went everywhere, including right down my top to my belly button! He was so into it and obviously having a great time. We got rained on, which I liked. We have great weather like this in Canberra! My daughters were waiting at the park with another sister for me to finish. 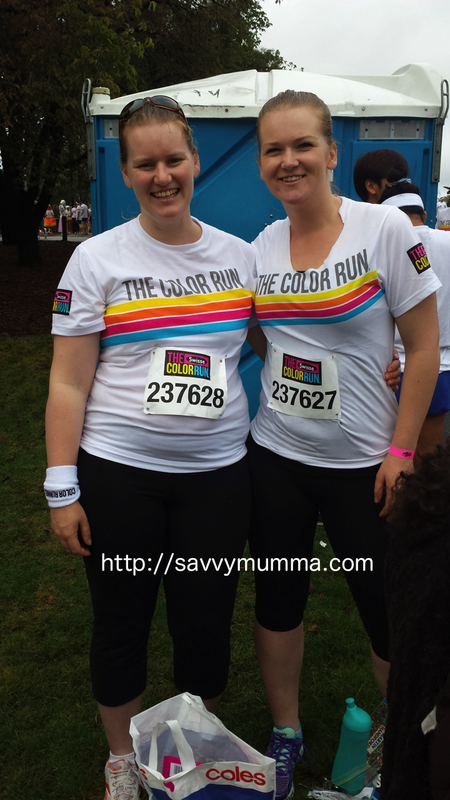 They want to do it next year, purely because they love the colours. They whinge walking to school which is less than 1km from our house, so not sure how they would go doing the 5km. 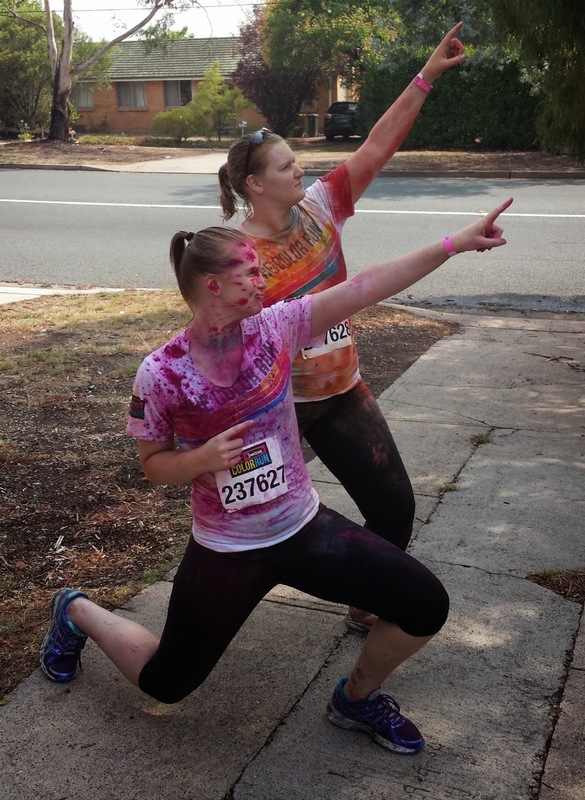 Have you done the Color Run? Thank you to my sisters niece, her husband and our other sister Jac Lambert for taking pics! I have long lashes that curve up naturally. Those are also my natural eyebrows, as in no plucking or waxing. Tinting your own lashes takes longer than doing it in a salon because to do it properly you can only do one eye at a time. Be aware this is risky, you need to test your skin to make sure you won't react, you need good eyesight and please be really careful. 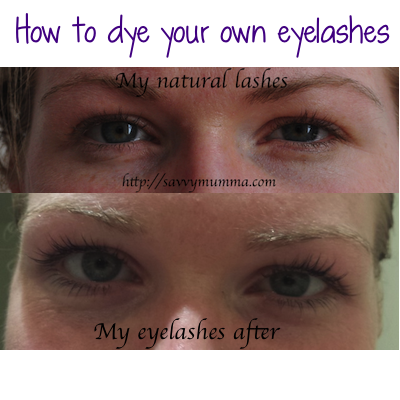 If any dye gets in your eye, rinse it immediately! Follow the instructions on your kit carefully! Wipe vaseline under your eye and on your eyelid to prevent staining if the tint gets on your skin. 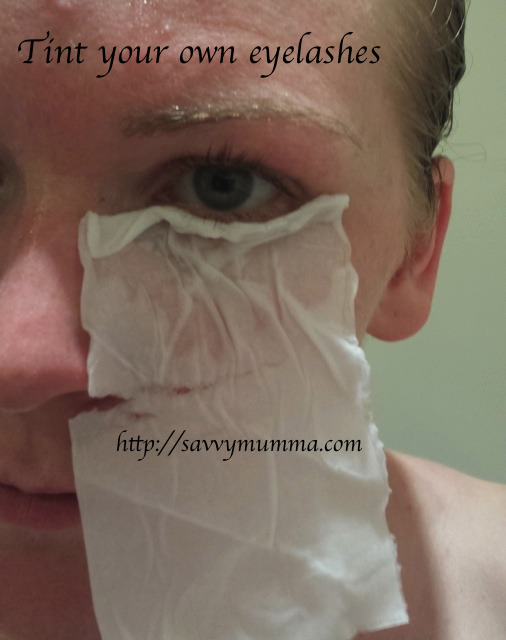 Wet a tissue and either cut or bend the top to sit neatly with the curve of your eye then place it under your eye as shown. Mix the tint/dye as per the instructions in your kit. Mine is 10drops of peroxide to 1cm of colour squeezed from the tube. You don't need a lot of tint. Mix until smooth, close your eye and apply the tint to your lashes. I do one eye at a time so I can see what I am doing. 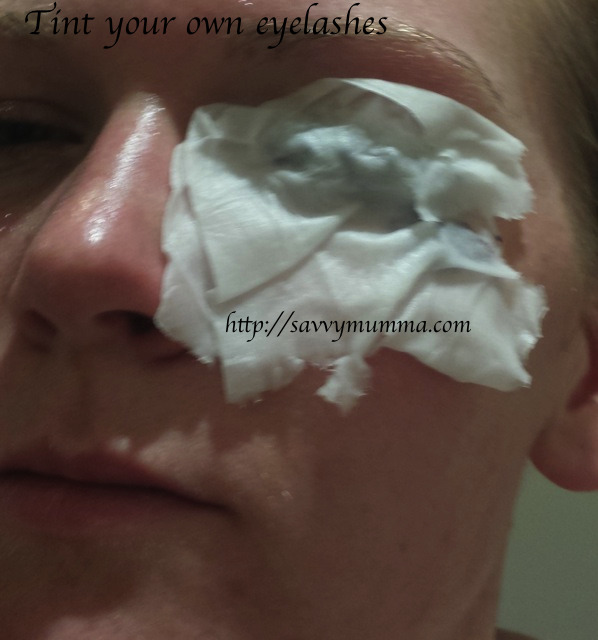 Fold the tissue over your eye. I do this as it darkens everything and I am less tempted to open my eyes. We always did it this way in the salon when I worked there too. It is more relaxing. Leave your eye closed and wait for 5 - 10 minutes, depending on your tint and instructions. Grab the tissue and wipe it away from your eye without rubbing it into your eye. 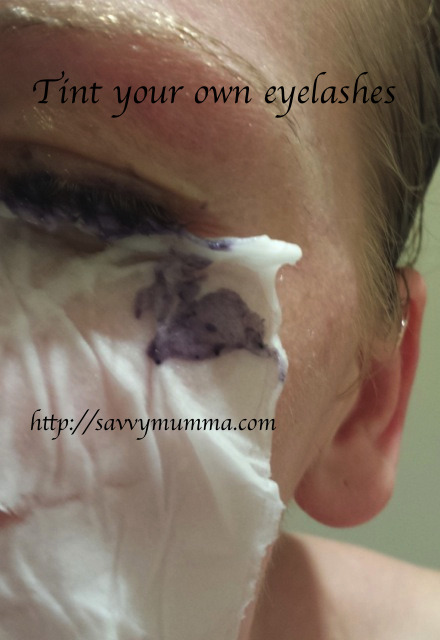 Wet more tissues and thoroughly rinse your eye with water to remove all the dye. DO NOT open your eye before all the dye is removed. If at any point your eyes sting, remove they dye and rinse your eyes immediately. An eyelash tint costs about $20 in my area. More than the cost of a kit which will do multiple applications.